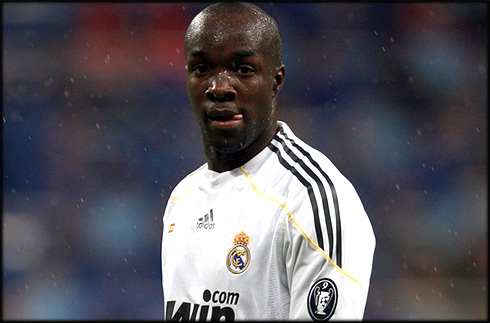 ﻿ Lass Diarra: "We'll try to help Cristiano Ronaldo scoring as many goals as possible"
16.12.2011» Diarra: "We'll try to help Ronaldo scoring as many goals as possible"
Lassana Diarra landed in Madrid in January 2009, precisely 6 months before Cristiano Ronaldo's arrival. The French player granted an interview to Real Madrid's official sponsor, bwin.com, and besides praising his teammate Cristiano Ronaldo, he also noted that the team is highly focused in bringing the 3 points from Sevilla this Saturday. Lass Diarra might not be technically gifted, but the French midfielder certainly has the ability to "sweep" an entire midfield with his neverending stamina. Diarra granted an interview to bwin.com, remarking that Cristiano Ronaldo's nose for goal is unmatched and that the team will try to help him increasing his tally, but only after the first and main priority is reached, which is winning titles. The French player has also previewed the match against Sevilla, that will be held this Saturday in the Sánchez Pizjuan and confessed to be waiting a very tough match. The "Clasico" blow took place almost a week ago and Lass Diarra assures that not only it won't affect the team, as it also won't make them change the way they've been working and doing things so far. Diarra: "We're not going to do anything differently. We've been following our plan over the last two years and we've always been very close to win La Liga. I honestly hope that this is the season where things will work our way. We just have to focus in keep giving our best and fight until the end", promised the French player. Regarding his teammate Cristiano Ronaldo, Diarra naturally doesn't have second thoughts when it comes to rank him as one of the best players in the World. Diarra: "In every match he shows why he can score more than 40 goals this season. But I'm sure that in his mind as in any other Real Madrid's player, what matters the most is to win the title. If we achieve that objective, we can then help him scoring more goals in a more proeminent way. Everyone knows who Cristiano Ronaldo is: He's one of the best players in the World", fired Diarra. When previewing the important match against Sevilla this Saturday, Diarra was obviously very cautious but he still noted that it would be extremely good to enter the new year with a 3-points advantage over Barcelona. Diarra: "Sevilla has a great team and their stadium has definately a terrific atmosphere. I think that if we play seriously the entire game, as we've been doing so far, then we can win this match. As I've said before, we want to bring the 3 points home so we can go into vacations with a lead advantage, but we'll have to be very carefull with Sevilla." Diarra recently completed his 100th appearance for Real Madrid, but despite the constant rumors about the French player wanting to leave the club, he assured to be truly happy in Madrid. Diarra: "I would proudly play another 100 or 200 matches for the club. Real Madrid is one of the best clubs in the World and to have the opportunity to play here is a great honor". Real Madrid will clash with Sevilla this Saturday, for the Spanish League. Cristiano Ronaldo should be on the line-up in this game, which will be held in the Sánchez Pizjuán. You can watch Juventus live stream, Sevilla vs Real Madrid this Saturday for "La Liga" and QPR vs Manchester United on Sunday, for the English Premier League. You may also follow Barcelona vs Santos for the FIFA Club World Cup final. All these games are available from our football live streams section.